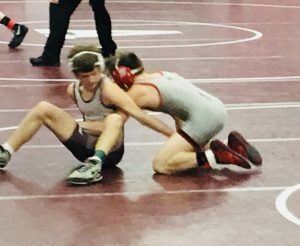 ALTOONA – The opening round and quarter finals were wrestled at the 2019 PIAA NW AAA Regional Tournament Friday night at the Altoona Area High School Field House, and the Bison have three wrestling Saturday morning for a chance to be in the finals. Seniors Johnathan Thomas (12-2) at 106 and Caleb Freeland (26-9) at 145, and freshman Mark McGonigal (29-7) at 152 all punched their ticket into the semi’s with strong nights. Bison Johnathan Thomas (12-2) scores an opening takedown over Altoona’s Luke Hileman. Thomas will wrestle in the semi-finals this morning. Johnathan Thomas won his sole match of the evening with a 5-4 win over freshman Luke Hileman (27-12) of Altoona. Hileman was the District 6 runner-up last week. Thomas will wrestle District 10 champion Jacob Van Dee (33-11) of Erie Cathedral Prep in the semi-finals. Van Dee won his district in a two man bracket last week, and in the quarter-finals beat freshman Derek Keen (27-8) of Central Mountain by a 7-4 score. The winner at 106 will either wrestle Mifflin County’s freshman Nicholas Allison (32-3) or Saint Mary’s Lane Dellaquilla (15-9). Then senior Bison Caleb Freeland made it to the semi-finals by pinning his first opponent and obtaining an injury default in the next battle. Freeland first pinned senior Albert Heister (5-21) of Juniata in just 1:26. Moving to the quarter-finals, Freeland then lateral dropped sophomore Lane Porter (22-10) out of bounds twice before Porter suffered a presumed head injury and defaulted. Freeland will now wrestle Erie Cathedral Prep’s sophomore Paniro Johnson (33-5) in the semi-finals. Paniro was the District 10 champion this year and the match should be a good one. On the other side of the bracket, either Brashear’s senior Joe Mwete (29-2) or Dubois’ senior Dalton Woodrow (30-3) will be wrestling in the finals. Finally, freshman Mark McGonigal punched his ticket to the semi-finals with a 3-0 decision over senior Alonzo Henry (23-12) of Central Mountain. Prior to that, McGonigal major decisioned freshman Anson Wagner (11-21) of Mifflin County with a 13-0 clinic. McGonigal will now meet Erie Cathedral Prep’s Marques McClorin (25-14) in the semi-finals. McClorin was the District 10 champion in his bracket this year, and he defeated senior CJ Shreffler (19-12) of Cranberry by a 6-5 decision in the quarter-finals. The winner will meet up with either Bellefonte sophomore Ethan Richner (32-4) or senior Nick Rinella (29-4) of Meadville. Of the nine wrestlers that Clearfield sent to regionals, all of them remain alive for Saturday morning. Freshmen Nolan Barr (21-13) at 113, Karson Kline (25-15) at 120, and Oliver Billotte (14-7) at 195 each won their preliminary matches before falling in the quarter finals. Senior Jude Pallo (21-9) lost his first match at 138 but received a first round consolation bye. Junior Brett Zattoni (11-22) was defeated 2-1 in his preliminary round at 170 but also received a first round consi bye. Finally, senior Avry Gisewhite (18-16) was pinned in the opening round at heavyweight. Gisewhite will wrestle in the first round tomorrow morning. Overall, Erie Cathedral Prep is currently leading the team race with 56 points and nine wrestlers in the championship bracket. In a distant second place, Mifflin County trails with 40 points, followed by Central Mountain with 35.5 points. Clearfield is currently sitting in sixth place overall with 27 points out of the 25 teams in attendance. Full results, courtesy of PA-Wrestling.com can be found here. Wrestling is set to begin at 10:00 AM this morning at the Altoona Area High School Field House with two consolation rounds, followed by a round of semi-finals and consolation wrestling to be held around 12:00 PM. The consolation semi-finals will be held directly after that. The Parade of Champions is set to be held at 6:00 PM followed by the finals for both 1st & 2nd and 3rd & 4th place. Only the top three wrestlers will advance to Hershey to participate in the PIAA AAA State Tournament. Who will stand on the podium tonight? Stay tuned!